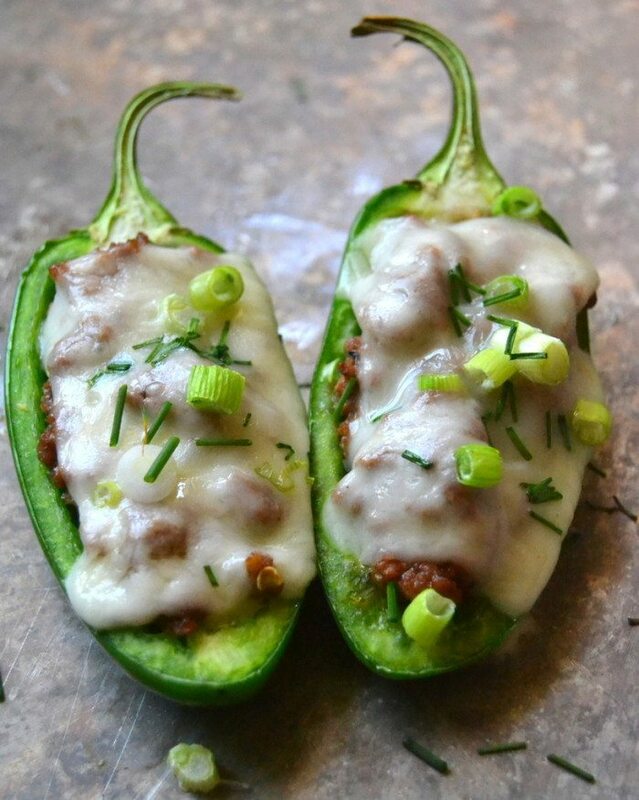 Cheeseburger Jalapeño Poppers ~ these healthier baked jalapeño poppers are stuffed with seasoned ground beef, and topped with plenty of melty cheese. Rinse the jalapenos and then, using a small serrated knife slice them in half, lengthwise. Carefully scoop out the inner ribs and seeds. Set some of the seeds aside. Melt the butter in a skillet and brown the ground beef, breaking it up as you cook it. You want the meat to be finely crumbled. Drain any excess fat, if necessary, and add the ketchup, Worcestershire sauce, onion salt and pepper. Add some of the reserved jalapeno seeds into the pan, if you like the heat. Taste the mixture and adjust the flavor and heat to your liking. This next step is optional, but I like to give each pepper half a quick roasting on a hot griddle. Get the pan really hot and set the peppers on the pan for s couple of minutes until they char at bit. This gives them extra flavor. Now set the peppers on a baking sheet and fill each one with the meat. Pack it down and then mound a little more on top so you get a good amount without toppling the pepper. Place a slice of cheese on top of each pepper and bake for about 5 minutes until the cheese is melted and they are hot through. Garnish with the scallions and chives and serve piping hot.